The Self-Defense Basic Training Cane is an introductory cane. This cane comes only in 1” round oak with a max of 36’’ in length. Any longer length would be a special order. The cane is then sealed in a basic oil finish. This stick may be used for any training or self-defense work. Includes round or softly angled horn and three sets of shaft grips. The Self-Defense Basic Training Cane is an introductory cane. This cane comes only in semi-round hickory, lengths up to 38’’. The cane is then sealed in a basic oil finish. This stick may be used for any training or self-defense work. Includes round or softly angled horn and three sets of shaft grips. Cane above is finished in glossy tung oil for illustration. The training cane plus is a 36 inch long, 1 ⅛ inch oak octagon cane with a softly shaped bird’s head, shaft top and bottom grips, and softer center shaft serrations. May be customized upon request. Pictured below is a training cane plus which has been customized (at additional cost) with Swarovski crystal eyes, red mahogany stain, and sharp serrations. Black belt canes are great intermediate canes. Significant use in self-defense or martial arts kata demonstrations. It allows a max length of 36’’ in oak and max length of 38’’ hickory. Any longer length would be a special order. Cane includes horn of your choice, top and bottom shaft grips, center shaft serrations. Gloss tung oil finish. Can be customized, as pictured here with triple grips and a black walnut finish. Many times we get requests from people who want a combination of features different than those readily available. Special order canes come in any length, also any length over 38’’. Special order canes come in oak or hickory. Occasionally we have laminates in stock. Pictured below is a one of a kind hickory / pecan laminate SWORD taper, with Blue Swarovski crystal eyes and a turquoise inlay bird’s head beak. The sword tapers from one inch at the top to ¾ inch at the bottom, and has a sharply beveled inside edge. New and unique, these individually handcrafted backscratchers serve multiple purposes. First, they have great reach to scratch those hard to reach spots on your back, because they are a whopping 18 to 19 inches long! Next, when something goes bump in the night, and you don’t have access to any other type of self-protection, reach for your backscratcher with the unique hand grip that allows you to fend off an attacker. Made in the USA of American hardwoods, we are offering two models, including the Dragon Master Scratcher, and the tamer Just-Ducky scratcher model. This is the weapon that is sweeping the martial arts world as the latest self-defense training craze. Watch the self-defense kata demonstration below to see the many ways you can protect yourself and train in a new martial arts manner. The first book of its kind that is a comprehensive work-bench manual on how to make your own customized self-defense cane. Fourteen chapters (over 120 pages) include everything from the “why make your own self-defense cane”, to an extensive gallery and plans section featuring over 60 illustrations and several sample plans. Covering everything from selection, horns, grips to tips, and special features. 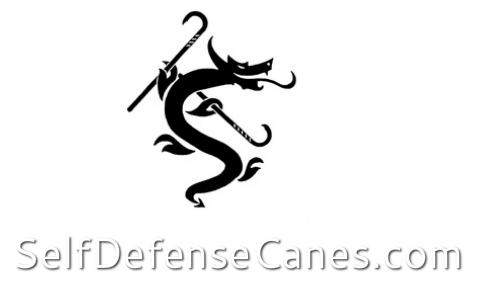 Also included is a listing of cane DVD’s, training systems, and personal reviews.